A treasure trove of humorous poetry written by students at Sault Ste. Marie High School for the Su Hi student newspaper was discovered in the Local History Collection of Traverse Area District Library by intrepid volunteer Marlas Hanson. 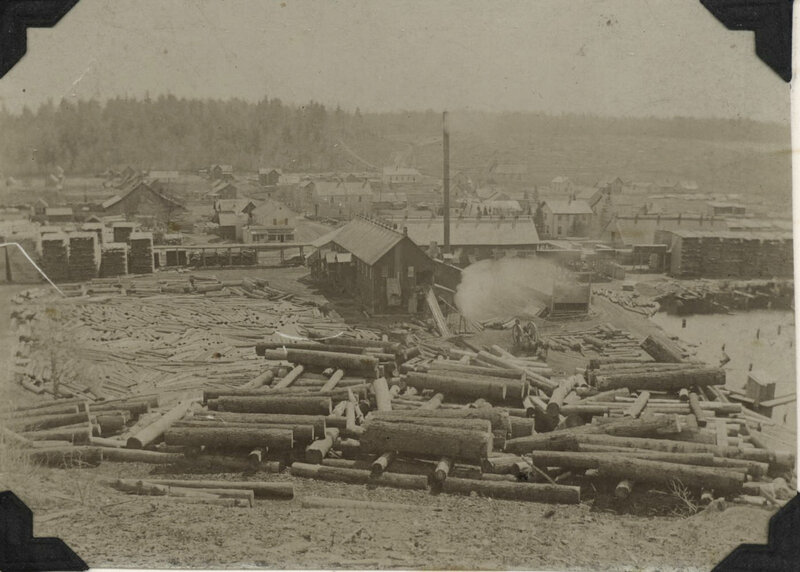 Hanson has been working with the papers of the Johnson Family, who were lumbermen of Traverse City. 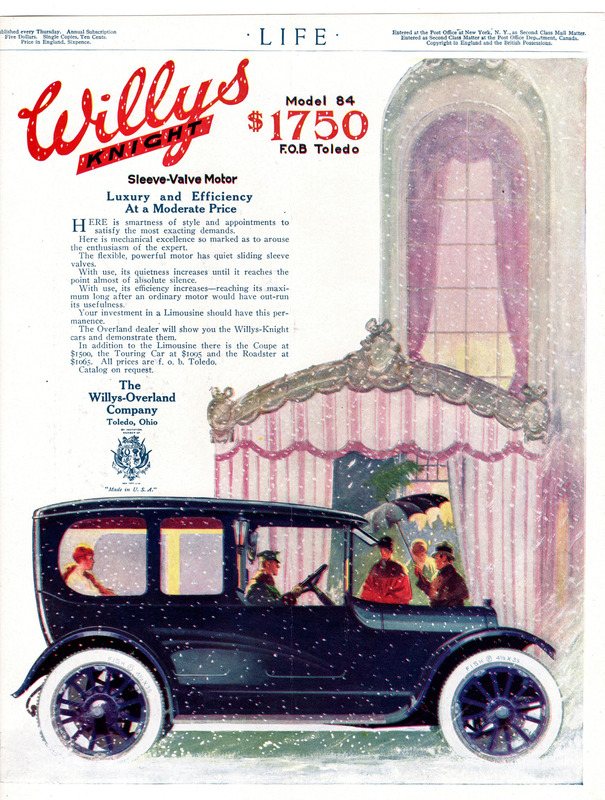 Besides documenting the family business, consisting of securing lumber for the Michigan Paper Company, a paper mill in Muskegon, the collection also documents the courtship and marriage of W.B. Johnson and Earnestine Gunn. We believe Earnestine may have worked at Su Hi with the student newspaper, and that is why the Johnson family had these gems in their collection. Unknown friend of Hanley Wilhelm. Image from a photograph album containing pictures of the area taken on touring trips Hanley Wilhelm and friends made before WWI (1913-1915). Hanley died of the flu during the war. 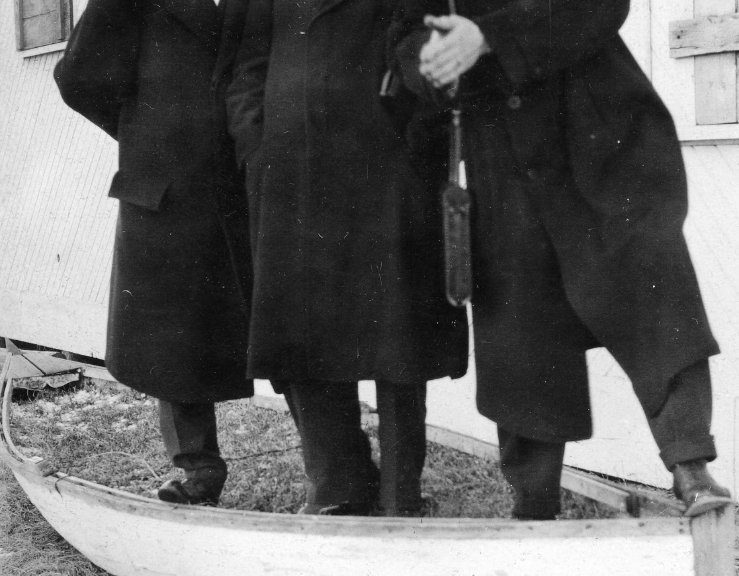 Image from the Local History Collection, Traverse Area District Library. When we look at black and white photographs of bygone eras, we have a tendency to think the people must have been as stiff and stodgy as they seem to be on film. Surviving documents, like this poem, prove otherwise. We wish we could give credit where credit is due, but alas, the poem is unsigned. And how mad she was about it! And the cutting things she said! I’ve never really gotten over it. O.W. Johnson, the author of the following poem, was one of the Johnson Boys, sons of Johnson, all of whom were lumbermen. They may have all spent time in the woods, as O.W. mentions here, but the family made their money speculating and trading lumber, as opposed to cutting it themselves. O.W.’s untitled poem is a humorous little ditty, written by an amateur poet (at least, we did not find anywhere that he had been published.) 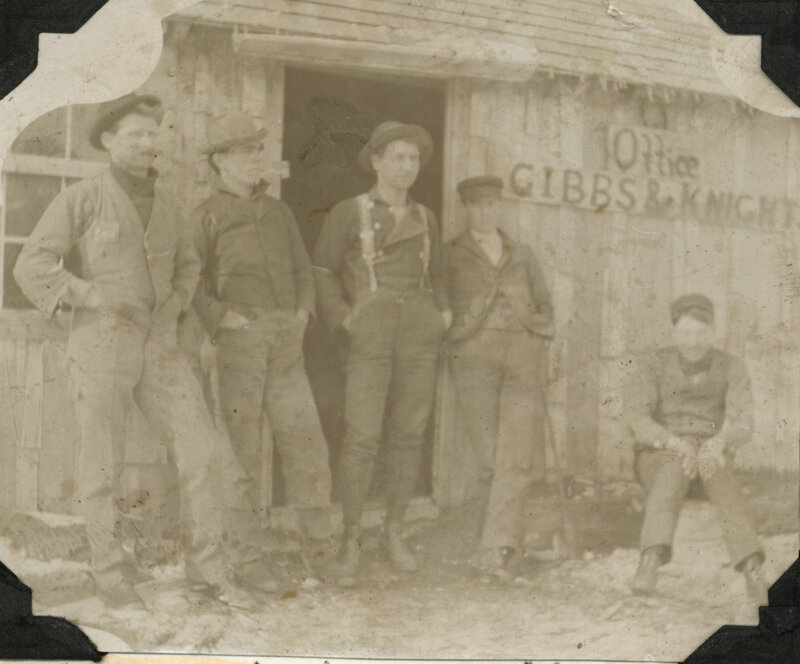 It was recently rediscovered among the working papers of the Johnson family in the Traverse Area District Library Local History Collection by our good volunteer, Marlas Hanson, and we simply found it too fun not to publish! He thought his car was just about the only thing in sight. He’d steal away from Sam’s Cafe into the Silent Night. And had a little office up along the railway track. 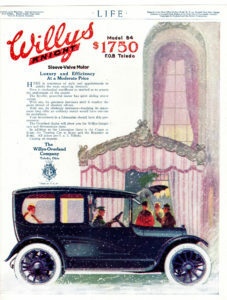 Advertisement for 1960s Willys-Knight Model 84 Limousine. 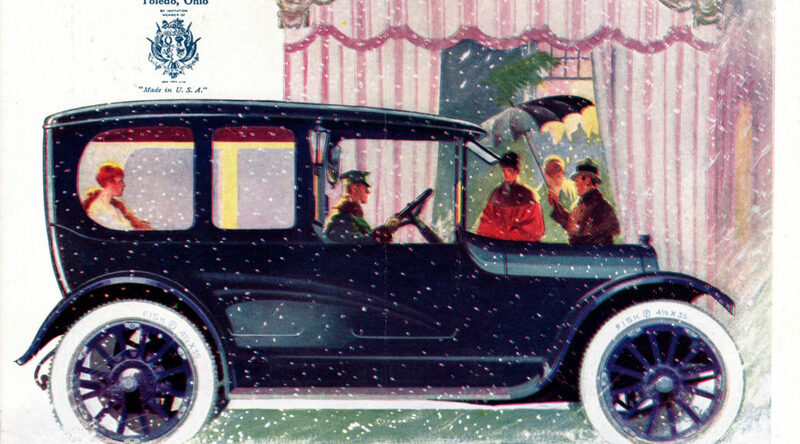 Image courtesy of Alden Jewell, made available through license CC BY 2.0, https://www.flickr.com/photos/autohistorian/31890309712. To take a Traverse City friend out for a little ride. The purring of the engine showed the load it had to carry. 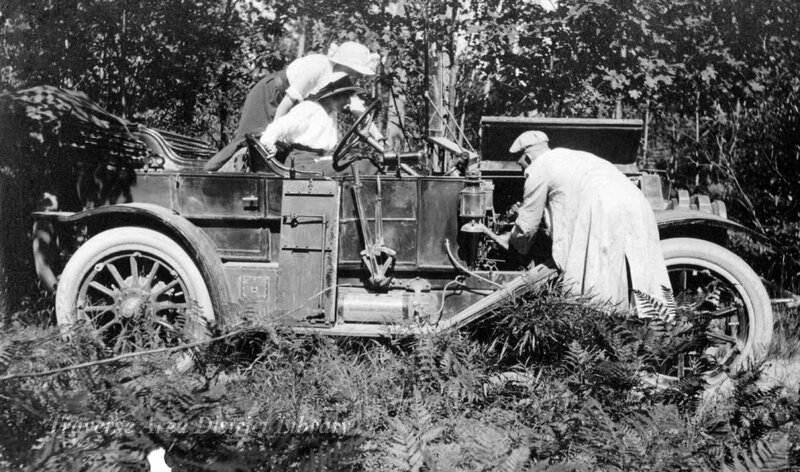 Frank Haden & sister Miriam, with Frank attempting to repair their auto. From the Hanley Wilhelm Photograph Album of pictures taken by Wilhelm and his friends in the early to mid 1910s. Don’t be afraid I’m only going off to carry wood. 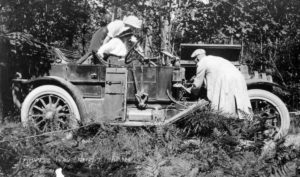 A Traverse City auto man, quite small around the gut. But Johnson was dumfounded and very nearly dropped. “Have I hurt the car” said Mr. J. His eyes were full of tears. We have all seen them, but we haven’t given them names: a swarm of tiny insects flying in a crowded formation often looking like a column. Certainly, it is much taller than wide, its width usually not more than a foot or two at most, its height often taller than we are. Our fear is that the insects will bite us, or, at the very least, we might inhale them. Unlike birds and bats, we do not relish them either for flavor or for nourishment. We steer clear of them and go about our business. 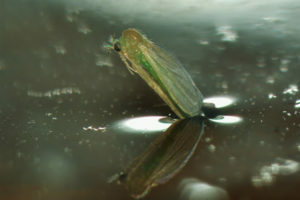 Midge swarms form in summer and early fall. The insects comprising them do not bite, though that passivity is often not enough to keep humans from spraying poisons on them. They transform from aquatic larvae, tiny forms resembling segmented worms, ready to mate upon emerging from their pupal cases, but not ready to eat since they do not possess the required mouthparts. So it is they do not harm us. Most members of the swarm are male: they seek to mate with females that pass through the mass of flying insects. Upon being fertilized, the female will set about to lay eggs in the waters of ponds and ditches. Several broods are produced during the year with the last overwintering in mud underneath the ice. “Midge Swarm near Cass Street Bridge,” Richard Fidler, pen and ink drawing. 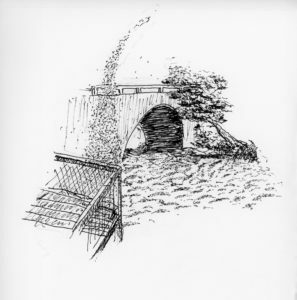 According to Donald W. Stokes, author of A Guide to Observing Insect Lives, midge swarms are often found close to water, often above prominent features called “swarm markers.” These can be patches of light or dark on the ground, or high points such as the upthrust branches of a shrub or tree—or even the top of your own head! A shiny black piece of plastic will attract a certain species, if one wishes to try an experiment. Swarms may form in the morning, evening, or even mid-day, depending on the species. Considering that the insects do not live for more than a couple of days, the observer cannot count on a week of entertainment. New broods, though, will prolong the joy of avid midge watchers. The poets often portray the fleeting lives of mosquitoes (midges) as emblematic of the fleeting existence of things we imagine to be great and eternal, things like palaces and the Capitol (Kyoto). That is what we should take away from our experiences with midge swarms: the beauty and wonder of ephemeral things that live out lives unnoticed by us all. 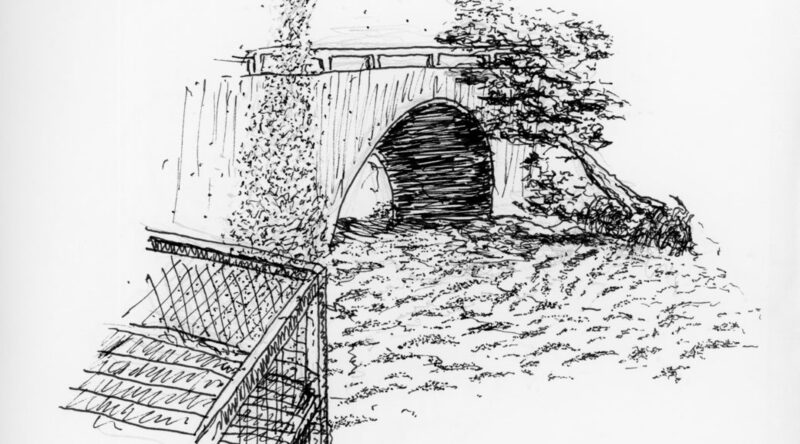 Mary K. Buck, whose poetry we’ve featured before, comes again to grace our pages with her thoughtful pen. Buck was a strong advocate for women and letters, and we think she would be pleased to be remembered in conjunction with Women’s Equality Day. A day often forgotten in women’s history, Women’s Equality Day is celebrated on August 26th, when we remember the passing of the 19th Amendment to the United States Constitution, guaranteeing women the right to vote. 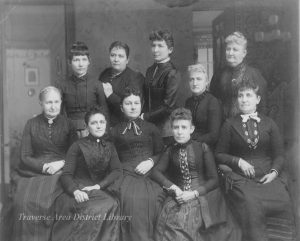 Ladies’ Library Association, pre-1892. Mary K. Buck is on the far left, back row. Buck did not live to see the Woman’s Suffrage movement achieve its penultimate goal, but in her lifetime, she touched the lives of many Traverse City women looking to learn and achieve. She was one of the founders of the Ladies’ Library Association, she supported the authorship of many of her friends by editing their works, and she co-authored two books in her lifetime with journalist M.E.C. Bates. This poem, The Ideal Woman, comes from her book, Songs of the Northland, published posthumously by her husband in 1902. What does this poem say about how women viewed each other at the turn of the last century? Clearly, the Suffragette and socialist cry of “sisterhood” extended even to remote Traverse City. It makes one wonder: What did those ladies talk about at the Ladies’ Library Association meetings? Which type were best of those we most admire? To eyes more critical devoid of grace. And charity embracing God’s wide world. Slow in her censure, ready with her praise. Seeing the good, yet steadfast ‘gainst all wrong. But modest in her claims for self alone. And faith in holy things befit her well. For ages yet to come. “Old-Fashioned” these! A queen in her own realm, or court, or cot. So Solomon described her, long ago. Her friendship is a boon one well may crave. But gentle, gracious, lovable and true. Wilt thou fulfill for us the grand Ideal? They destiny at will. What shall it be? The toil and travail of thy sisterhood. The right to think, to labor, to achieve! And give the world its noblest womanhood. 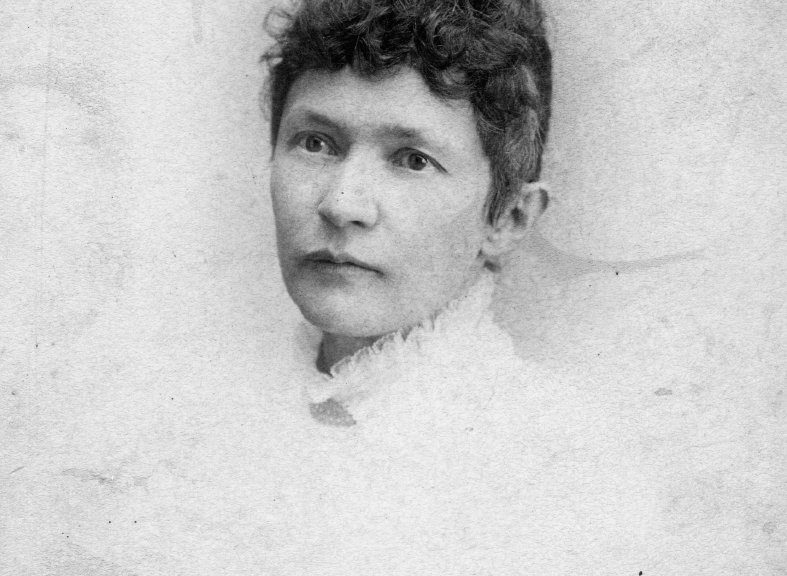 Mary K. Buck, portrait, undated. An unusual entry is Mary K. Buck’s Songs of the Northland (1902), published posthumously. 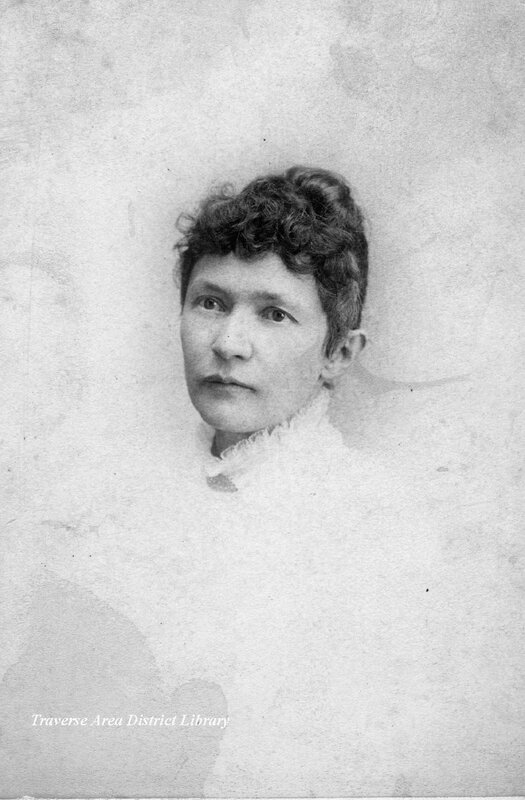 Mrs. Buck (1849-1901) was born Marjanka Knizek in Bohemia and came to Traverse City, Michigan, at the end of the Civil War. She attended college, became a schoolteacher and a contributor to several nationally circulated magazines. 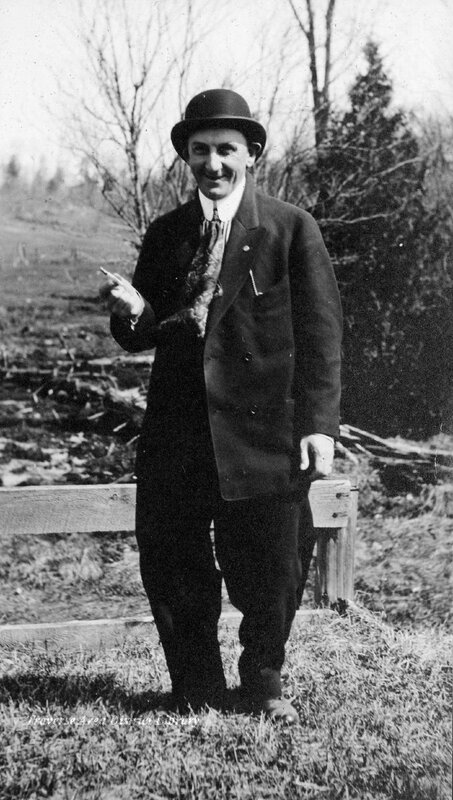 She also collaborated with Mrs. M. E. C. Bates on a volume of northern Michigan stories, Along Traverse Shores. This fun poem comes to us courtesy of the Kingsley Branch Library, where it resides in their local history and genealogy collection. We hope it gets you in the mood for May, also known as National Barbecue Month. 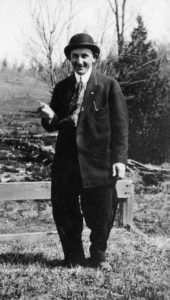 Rowell J. Blackhurst married into the famed Halladay family of Mayfield (yes, those Halladays), and remained a prominent fixture in the community, both in his professional career and philanthropic activities. He was also, clearly, a man of verse and a keen observer on human nature. These guys are ready to party, beer and barbecue-style. Gentlemen sitting outside the Gibbs and Knight Mill office at Mayfield, 1906. 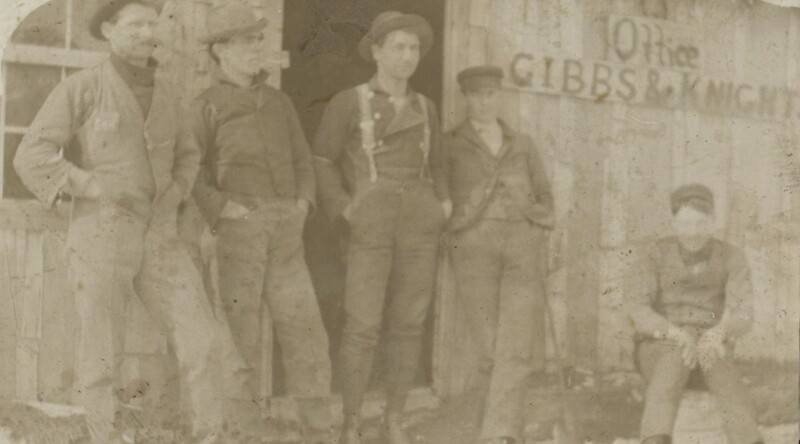 Image courtesy of the Floyd Webster Historical Photograph Collection, Kingsley Branch Library. His poem is littered with clues that tell us about himself and the era he lived in. Let’s look at one in particular: Why would people in “the autumn of thirty four…thank God that they hadn’t starved to death?” No great famine befell our region during that time. My guess is that Blackhurst felt the nation’s suffering was waning after the stock market crash of 1929 and the Depression, even in rural Mayfield. Or did the line refer to the end of Prohibition (which took effect in 1934), that unhappy time nudging some to near “starvation”? That might better explain the later references to the volume of alcohol consumed at the picnic. With those national events framing the celebration the poet goes on to describe, one wonders at the seemingly thanklessness of some of the attendees. But, let’s be real. People have always had opinions, and that will continue, in good weather and bad. Mayfield in 1901, when “Pine was King.” Image courtesy of the Floyd Webster Historical Photograph Collection, Kingsley Branch Library. The crushing pressure of steam and steel. And thirty two years roll by my gate. Thank God that they hadn’t starved to death. Of a manner whereby they might rejoice. To the Public Grove in the old home town. To tempt a pernickety appetite. With an ice-cold bottle of Hi-powered beer. To be washed down with coffee the color of mud. Such a throng as milled restlessly under the trees. But nobody noticed a shortage of malt. That it would have been warmer left tied in the stable. And the beer drinking public was feeling its oats. ‘Twixt the hall in the woods and Baldy’s beer place. But finally it ended as everything must. Others decried it a miserable mess. For a great deal depends on — The Old Point of View.